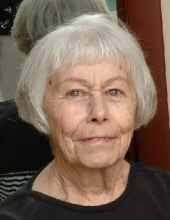 Beryl June Peterson, 83, of Pocatello, Idaho passed away on July 1st, 2018. She was born on July 24, 1934 in Park County to Esther (Case) and Fred Billman of Old Chico. She graduated from Park High School and married her high school sweetheart, Tom Peterson, in 1954. They ranched in the Paradise Valley before moving to ranch outside Douglas, AZ. They moved to Pocatello in 2017 for health issues. Beryl was preceded in death by her parents; Bill Billman (brother); Alberta Isom (sister); Floyd and Hazel Peterson (father and mother in-law) and Sam Lopez (son in-law). She is survived by her husband, Tom Peterson; son Nick (Cindy) Peterson; daughters Penny (Nelson) Cooper and Tana (Fred) Edington; granddaughter Angela (Guy) Hadden; grandsons J.D. (Cori) Lopez, Gideon (Beka) Peterson, Thane (Katie) Peterson and Will Edington; grandchildren Miranda, Jed, Bailey, Samantha, Madeline, Harper, Sage and Case. There will be a gathering of friends and family on September 29, 2018 from 2:00 p.m. – 4:00 pm at the Emigrant Hall. All are invited to visit and reminisce. We ask that memorials be sent to the scholarship fund, Shining Mountain Club, c/o Rose Rigler, Box 34, Pray, MT 59065.